THE GALAXY EXPRESS: Two Free Science Fiction Romances! Two Free Science Fiction Romances! 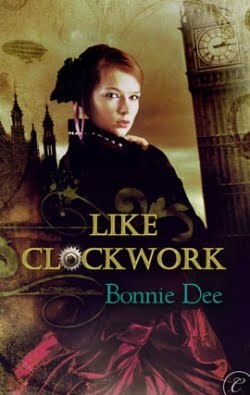 Pre-order Bonnie Dee's steampunk romance LIKE CLOCKWORK (Carina Press) for free! Use the coupon code CLOCKWORKFREE at Checkout. This is a limited time offer, so hurry! Victoria's work with automatons has gained her renown and changed the face of London. But her concern that the clockworks are taking too many jobs away from humans, creating social unrest, is ignored. Given the ugly mood of the underclass, she fears more outbreaks of violence similar to the murder spree of the notorious Southwark Slasher. Dash, unemployed thanks to the clockworks, has pledged fealty to The Brotherhood, a group determined to bring about the downfall of the automatons by any means necessary. His plan to kidnap Victoria goes awry when the unorthodox scientist pledges her assistance to their cause. Also, LK Rigel is offering a free digital copy of SPACE JUNQUE, her SFR novella (space opera) to the first five people who leave a comment at this post. There's only four copies left, so head on over. Look for my post on SPACE JUNQUE next week.